In fact, this is the second customized version of the addon that adds a bus from the game Fortnite. We have already published Fortnite locations for MCPE where a similar bus is built but it does not move. So if you really need the fortnite bus then install this excellent addon. It is unlikely that you will find anything better than this because of a number of reasons. Firstly, the bus has a great model and looks just amazing. Can this be done even better? Secondly, it's moving! This is achieved thanks to the logic of some of the mobs that have been replaced. Well, in the third, the bus is able to transport players, albeit with some shortcomings. 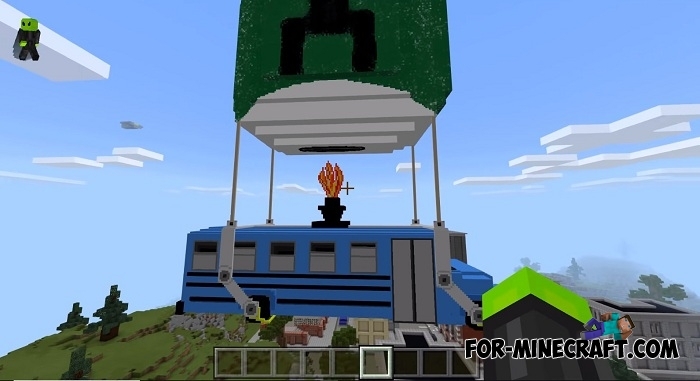 Unfortunately, you have to use the command blocks to get the bus to move. Also, the passengers inside this vehicle are in the wrong position (just below the bottom). Anyway, download the thematic map and addon and find out how it works. How to install the Fortnite Bus addon?